Learn more about how PureBond is made in our Columbia Forest Products facilities throughout North America, or see what our different products look like in residential or commercial buildings. Have you ever wondered how plywood is manufactured? Here illustrates some of the manufacturing processes at a few of our North American facilities. Use our Product Visualizer to view our products as they might appear on finished projects. Use the three options to specify a panel species, orientation and environment. 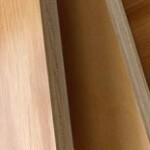 An explanation of plywood core features and advantages. Includes particleboard, MDF, veneer core, Combi-cores and Multi-ply cores. A guide to understanding popular hardwood plywood and veneer face grades. Columbia Forest Products is proud to offer an exciting variety of hardwood and decorative softwood species of faces to meet the demand for architectural individuality in interior design applications. PDF version of Columbia Forest Products available hardwood and decorative softwood species of faces.